Profile Projector, Horizontal Profile Projector, Vertical Profile Projector, Dynascan Profile Projector. Our Price range varies from 240000 to 440000 based on specifications. Banking on the technical expertise of our professionals, we trade, supply and import a wide array of Vertical Profile Projectors. These products are highly praised by the clients for their precise and reliability. Our Price range varies from 220000 to 440000 based on specifications. We offer entire range of Vertical Screen Profile Projector which is manufactured as per international quality standard. These are manufactured from qualitative range of raw materials, which is quality checked by our team of experienced professionals. We offer these vertical screen profile projector at most competitive prices. We specialize in manufacturing, supplying and exporting a vast and ruggedly constructed range of Bench Type Digital Profile Projectors. Known for their long service life, high performance and accurate results, our products are manufactured using premium quality raw material. Stringent quality tests are conducted by our experts to ensure clients that the products offered by us are in conformation with international standards. Our products are tested rigorously under the strict expertise our professionals, as they hold certification in domain.Banking on the technical expertise of our professionals, we trade, supply and import a wide array of Horizontal Profile Projectors. These products are highly praised by the clients for their precise and reliability. Our Price range varies from 260000 to 440000 based on specifications. We are offering our client an excellent quality range of Vertical Type Table Top and Floor Model Profile Projector. These are manufactured from qualitative range of raw materials, which is quality checked by our team of experienced professionals. We offer these Vertical Type Table Top Model And Floor Model Profile Projector at most reasonable prices. Our Price range varies from 370000 to 680000 based on specifications. Cross tables available 400x200mm with traverse of 200mm on 'X' 100mm on 'Y' axes. Screen Glass with Laser Marking with 360 Series. These Standard Profile Projector are reliable and affordable measuring system of high precision and efficiency. An excellent solution to the most critical requirements of high quality optical profile measuring suitable for measuring different shapes. We are offering our customers an excellent quality range of optical profile projector. These are manufactured from qualitative range of raw materials, which is quality checked by our team of experienced professionals. 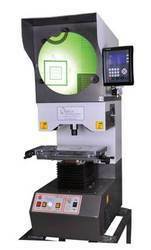 We offer these optical profile projector at most competitive prices. Our Price range varies from 280000 to 440000 based on specifications. Vertical type mitutoyo equivlant profile projector.